Heather Zar, MD, PhD, first thought about a career in medicine in high school. Pediatrics was an easy choice, and in medical school she found working with children very gratifying. Having grown up in a large family, she was comfortable working with children. She decided to contribute to the South African health care system by specializing in pediatrics. A residency in New York piqued her interest in pediatric pulmonary medicine. There, she learned about the immense burden of disease and also the urgent need for better treatments for children. She synthesized the two specialties in her doctoral thesis, with a focus on HIV-associated lung disease in children. Today she is a professor and chair of the Department of Pediatrics and Child Health at Red Cross Children’s Hospital, at the University of Cape Town. It is one of the largest African hospitals dedicated to the care of children. Her department runs a strong training program, including an African Pediatric Fellowship Program that serves pediatric pulmonologists from several African countries and builds capacity in child lung health, among other pediatric disciplines. 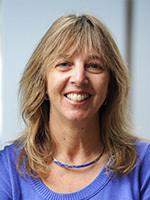 Dr. Zar is also director of the university’s MRC Unit on Child & Adolescent Health. Her present research focus includes common childhood respiratory diseases, as well as chronic non-communicable diseases. Increasingly she has focused on the early life determinants of health, and on the intersection between acute infections and development of chronic disease. Some of the most important work she and her team have undertaken is their current Drakenstein child health study. This multi-year birth cohort study follows 1,000 mother-child pairs from pregnancy through childhood, looking at the early determinants of child health in a peri-urban area of South Africa. There is a strong focus on pneumonia and on asthma, but the study is multi-faceted and investigates other outcomes like growth and neurodevelopment. This research also looks at child health determinants like home environment, mother’s health, psychosocial illness, nutrition, and genetics. “Townships are normally about as unsafe for outsiders as you can get, but so great is the buy in of the local people that health workers move freely to collect biological and environmental samples in these impoverished homes,” says Andrew Bush, MD, a professor at the Imperial College of London and honorary professor at the Red Cross Hospital in Cape Town. “The detail of the measurements made would be astonishing in a resource-rich area but is breathtaking in a low-income setting.” Dr. Bush regards Dr. Zar as one of the leading paediatric pulmonogists in the world. Pneumonia has been an ongoing emphasis of Dr. Zar’s work. Although there have been recent, important advances in vaccines to prevent pneumonia, it continues to be a major killer of children globally. Her work has included the development of better diagnostic methods and preventive strategies. Linked to this has been a focus on childhood tuberculosis, which is often a cause of pneumonia in children, in high TB burden settings. HIV-infected children may be especially vulnerable to developing pneumonia or TB. A substantial part of Dr. Zar’s work is centered on this particularly vulnerable group. Her research now includes an adolescent HIV cohort study on the development of chronic HIV-associated disease, including lung, cardiac, and neurocognitive disease. 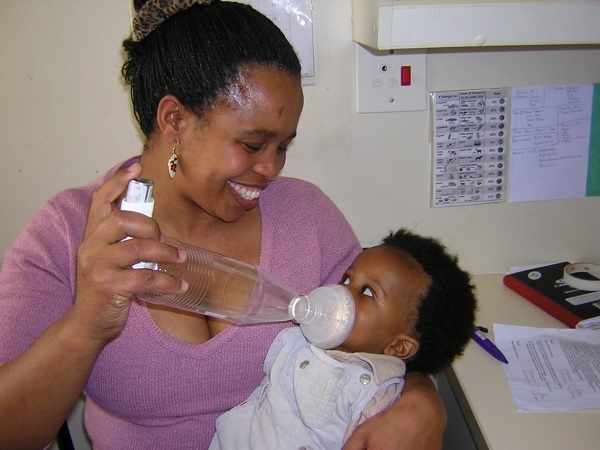 In the late 1990s, she and her team developed a homemade spacer using a plastic soda bottle to enable the use of inhaled asthma medicines in children. The device has promoted optimal asthma care in poorly resourced areas, where commercially produced devices were unavailable or unaffordable. For children under two years of age the spacers are used with a mask (pictured here). The spacers can be used with both types of inhalers, bronchodilators and inflammatories. Families are being taught how to make them from bottles, using a strong wire mold supplied by the Red Cross Children’s Hospital. Dr. Zar says that many of the most gratifying aspects of her career have been improving the lives children and families. Dr. Zar considers the science at the Annual ATS International Conference outstanding and enjoys meeting potential collaborators every year. She has benefited from networking opportunities at the conference, which enabled her to collaborate across disciplines, countries, and geographical regions. In 2014, she was “humbled and privileged” to receive the Society’s World Lung Health Award. The honor acknowledges contributions in health care inequality and efforts that have the potential to eliminate gender, racial, ethnic, or economic health disparities worldwide.